Guys ~~! You should leave comments at YT, show your appreciation!! Irrelvant news omitted ;D We’ve made the the 500,000 MARK and STILL going STRONG BABY! The Gaon Chart is the national chart of South Korea and is intended to be the equivalent of Oriconin Japan and Billboard in the United States. Check out the chart rankings for the week of April 8st to April 14th below! 120414 Donghae celebrates Super Junior’s Golden Disk with a kiss! As allkpop reported earlier, Super Junior added another record on their list of accomplishments by hitting the 500,000 mark for sales of their 5th album, ‘Mr. Simple‘. As fans around the world congratulated the group on the achievement, member Donghae joined in on the celebrations as well. The April 12th release of the Gaon Album Chart indicated that Super Junior’s ‘Mr.Simple’ album sold a cumulative 502,830 copies since its release last August 3rd. Related Post: 120413 Leeteuk Twitter Updates: We crossed 500,000 copies sold~~~!! 120413 Leeteuk Twitter Updates: I bought 490,000 out of the 500,000 copies? 120413 The Album Sales for Super Junior’s 5th Album ‘Mr. Simple’ Exceeded 500,000 Copies! 120413 Yesung Twitter Update: Breaking over 500,000 copies !! Super Junior‘s 5th album ‘Mr. Simple‘ has set a record for selling over 500,000 copies. According to Gaon on April 13th, ‘Mr. 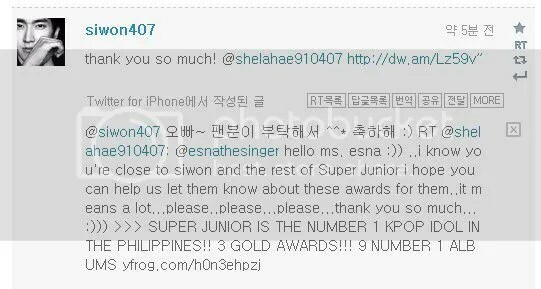 Simple’, which was released August 3rd, 2011, sold about 502,830 copies by the end of March 2012, which proves Super Junior’s immense popularity. Super Junior’s half-million record sales have only been achieved by 2 other artists, namely Kim Gun Moin 2003 with his 8th album ‘Hestory‘, and TVXQ in 2008 with their 4th album ‘MIROTIC‘. As soon as ‘Mr. Simple’ was released, it not only dominated the music charts in Korea, but also in Taiwan, Thailand, Philippines, and other countries. Super Junior also set a record in Taiwan for their track “Bonamana“, which held the #1 position on KKBOX’s chart for 63 weeks straight. “Mr. Simple” is following in its footsteps by holding the #1 spot for 34 weeks straight now. Super Junior, who is currently on their world tour, have already toured Asia 3 times before, uniting over 500,000 fans and evidencing their popularity not only through their album sales, but also through their concert ticket sales. On the 6th, they performed in Paris, France, which made them the first Korean group to hold a solo concert in France. After successfully completing their concert in Paris, Super Junior is continuing on their world tour to perform in Shanghai, China on the 14th, and in Jakarta, Indonesia, on the 28-29th. 120413 Leeteuk Twitter Updates: We crossed 500,000 copies sold~~~!! The album sales for Super Junior’s 5th album ‘Mr. Simple’ exceeded 500,000 copies. According to the Gaon chart announced on the 12th, Super Junior’s 5th album ‘Mr. Simple,’ which was released on August 3rd, sold a total of 502,830 copies by the end of March this year. Especially, Super Junior’s record of half-million sales follows those set by Kim Gun Mo’s 8th album ‘Hestory,’ released in 2003, and TVXQ!’s 4th album ‘MIROTIC,’ released in 2008, and is meaningful in that it helps revitalize the depressed album market and increase the interest in KPOP all over the world. 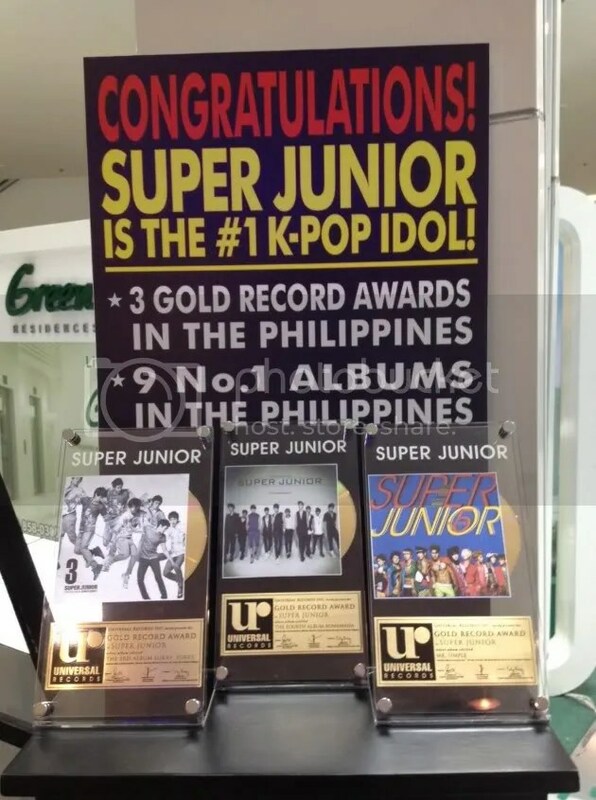 Also, Super Junior’s 5th album had swept 1st place on various music charts not only in Korea, but also in Taiwan, Thailand and the Philippines. Super Junior’s ‘Mr. Simple’ has currently been holding the 1st place on Taiwan’s KKBOX chart for 34 consecutive weeks following ‘BONAMANA,’ which set the new record of 63 weeks at No.1. 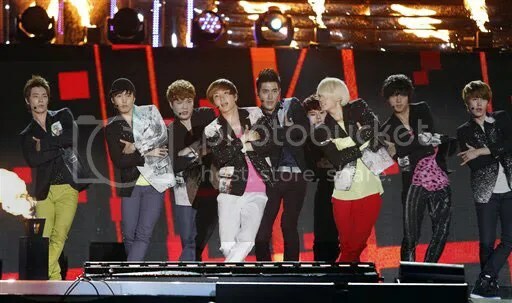 In addition, Super Junior drew audiences totaling over 500,000 people through their three previous Asia tours. Meanwhile, Super Junior became the first Korean group to hold a solo concert in Paris, France on April 6th and they are scheduled to hold ‘SUPER SHOW4’ in Shanghai, China on April 14th and Jakarta, Indonesia on April 28th and 29th. K-Pop phenomenon Super Junior (above) have added another feather to their cap after emerging as THE Korean act of the moment at a recent online fan voting contest. The South Korean boyband beat 36 other Korean acts to nab the MSN International Award, cranking up an overwhelming 323,355 or 61% of online votes with their winning song Mr Simple. Seattle-born rapper Jay Park, with 176,897 or 34% of votes, came in a distant second withTake A Deeper Look in the voting contest, organised by MSN as part of its exclusive coverage of the upcoming Golden Disk Awards. f(x)’s Pinnochio grabbed third place. In all, a whopping 526,942 votes were collected between December 5-26 as fans across the world logged onto their local MSN portals to cast their votes for their favorite K-Pop band and song. Some of the other 35 nominees include ‘The Boys’ by Girls Generation and ‘Fiction’ by Beast. This is the second year the MSN International Award is being conducted, the first of a kind that empowers K-Pop fans worldwide. MSN is the official online media of the Golden Disk Awards. Often dubbed the Korean Grammys, the Awards will be held next week, January 11th and 12th 2012 at the Kyocera Dome in Osaka, Japan. South Korean idol group Super Junior’s subgroup Super Junior-M made a “long stay” for two months in Taiwan this year to study Mandarin. They appeared frequently in Taiwan, stimulating sales of their Mandarin album “Perfection”. Adding on the fact that the pronunciation of “too perfect” is similar to that of “Taiwan is beautiful” and “Taiwanese girl”, they sold 60000 copies, becoming the bestselling South Korean artist in Taiwan. SJ’s new Korean album “Mr. Simple” was not far behind, selling 45000 copies, taking second place behind the first-placed SJ-M. On February 3, 4, and 5 next year SJ will be holding their concert at Taipei Dome, and the tickets will be going on sale at 1PM today through the 7-11 i-bon system. For more information please refer to the Taipei Dome’s official website. Jang Geun Suk released an album after experiencing success in acting. He came to Taiwan in June to hold a fan meeting and sold out both meetings, raking in NTD 26,720,000 (about $883000). With his explosive popularity, his album “The Lounge H Vol. 1” defeated Girls’ Generation, selling 40000 copies, and is the only artist in the top 5 that is not a part of a group. 4th placed Girls’ Generation’s “The Boys” sold 26000 copies. South Korean boy band CNBlue had a busy schedule this year, and even though they have not been to Taiwan to meet the fans, they still took 5th place with 20000 copies. In addition, Kim Hyunjoong (15000 copies), F.T Island (15000 copies), Big Bang (12000 copies), TVXQ (11000 copies), and f(x) (10000 copies) round up the top ten of the sales chart, selling more than 10000 copies each, proving the Hallyu wave’s popularity. Here’s the annual chart of 2011 Hanteo! SJ has 2 champions here!! (The right one is the individual album (5JIB’s ver A) sold this year(200,434 copies), the left one is the record of all of their albums (released since debut) sold this year(358,438 copies). Chuk ka hae yo!!! Note that SJ is the only singer sold over 200,000 copies of individual album on Hanteo in recent years! We would like to emphasize the difference of Hanteo and Gaon again and again- – Hanteo can basically represent the total albums sold in Korea(its chain occupies 80% of albums’ sales volume), and the statistic you see here is all sold already! Gaon only tracks what company gives out as distributed out to the market. The data shown includes albums which are sold and not yet sold! (of course Hanteo’s data is included in it) If SJ didn’t win GDA last year was because their total albums(1JIB-4JIB) sold within whole year ranked #2, then we are #1 this year~ All #1~ Go eat food, eat twice, eat thrice, keep eating!